I usually write about what goes in the pot, on the table, or fills the bowl. This post is about the bowl and where to find it. I’ve always found interesting things in my neighborhood – gadgets, housewares, and yes bowls. Shopping in Brooklyn stores is a unique experience. Relatively small, most shops have their own aesthetic with a limited but well thought out selection. Excited or bored, helpful or indifferent, there’s always the likelihood that the salesperson is also the owner/designer/artist/buyer of the merchandise your casually turning over and commenting on with your friends. It makes you think about what you say, and leave with a goodbye and thank you – like you would in Paris or an Ernst Lubitsch movie. Walking in and out of someone’s vision of their perfect store, it’s easy to daydream of what you’re own would look like – stock room, hassle, and rent-free. Head in the clouds, it’s probably what drew me to OpenSky. Up until recently, I’ve resisted any opportunities to integrate ads or products to my site. There weren’t any platforms that I found compelling enough to give up the freedom and flexibility of being commerce free. Nevertheless after a friend’s suggestion, several conference calls, a little research, and emails filled with nervous questions (mine not theirs), I’ve decided to give it a try and open the virtual store of my dreams. Full disclosure, I was offered one item from their roster of sellers for the launch and fell in love with these Buddha Bowls by Flavour Design. I thought they’d be great for steaming hot oatmeal and warm lattes this winter but couldn’t wait that long. Last week, I filled them with gazpacho and this week I decided to go green. 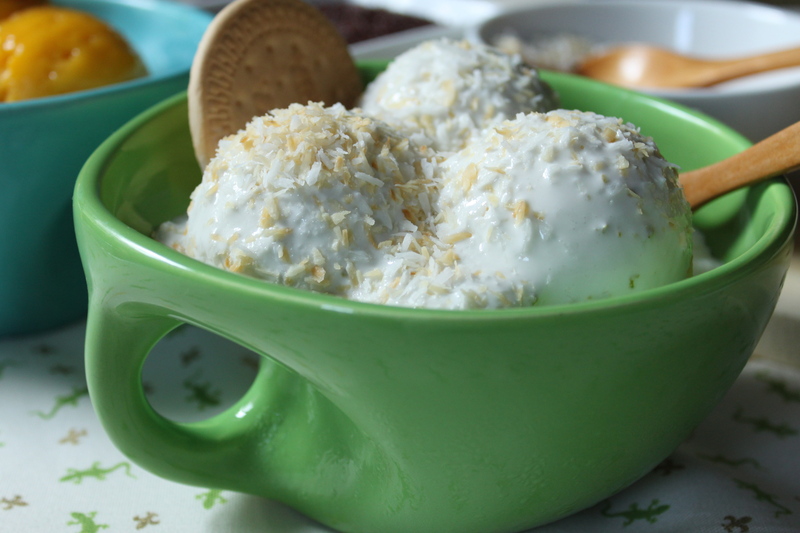 The snow pea bowl reminded me of limes stuffed with cocada, so I did a quick search for a fast coconut ice cream recipe. A perfect fit for the palm of your hand, it’s a comfortable way to have comfort food and the Baby Buddhas and Belly Plates are great too! Typical of the kinds of things I come across on Smith Street, I chose them to introduce my store where I’ll be able to connect you directly with the gadgets I depend on, ingredients I’ve sought out, and housewares I love. It’ll come together one piece at a time so I’ll hope you’ll check back often, say hello, let me know your thoughts, and be happy you stopped by. Click here to have a look around. OpenSky is offering readers a 25 % discount to celebrate, just enter the coupon code EXCITE 25. 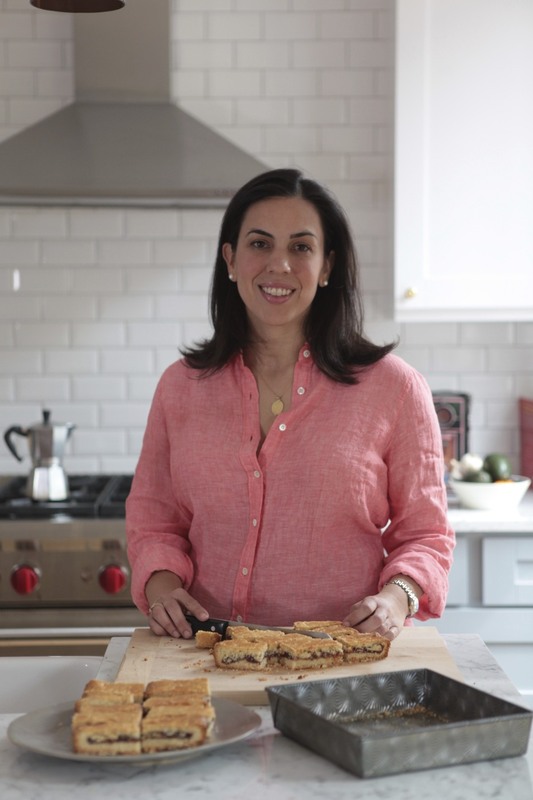 This recipe was inspired by Nicole Stich’s Delicious Days via David Leibovitz. I made a few changes, swapping out the saffron for lime and rum, but liked that it could be made quickly and in small batches. Too often I come across ice cream recipes that make 12 servings and are best served immediately. This will be my go to recipe when I’m not up for a last minute ice cream social. Bring all ingredients to a boil in a heavy saucepan over medium-high heat. Reduce the heat and simmer gently for ten minutes, stirring occasionally. Remove from heat, and chill the mixture thoroughly. Once chilled, freeze in your ice cream maker according to the manufacturer’s directions. I absolutely love that bowl! Boohooo, I miss Brklyn shopping! The contents of the bowl look damn good too! I’m so running over to get myself some of them cuz they are so damn cute. 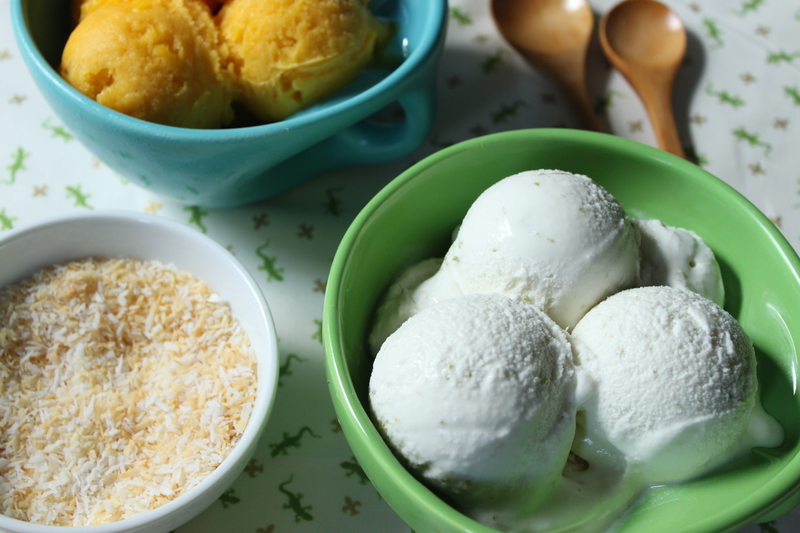 I’m also going to be making this ice cream cuz I love all things lime and coconut. i wish i could live in that bowl.